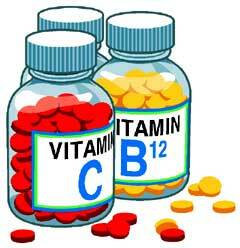 Note: You must take a B-Complex vitamin with any single B (numbered) vitamin for it to absorb. "The B-complex vitamins are essential to mental and emotional well-being. They cannot be stored in our bodies, so we depend entirely on our daily diet to supply them. B vitamins are destroyed by alcohol, refined sugars, nicotine, and caffeine so it is no surprise that many people may be deficient in these. Folic acid: This B vitamin is needed for DNA synthesis. It is also necessary for the production of SAM (S-adenosyl methionine). Poor dietary habits contribute to folic acid deficiencies, as do illness, alcoholism, and various drugs, including aspirin, birth control pills, barbiturates, and anticonvulsants. It is usually administered along with vitamin B12, since a B12 deficiency can mask a folic acid deficiency. Pregnant women are often advised to take this vitamin to prevent neural tube defects in the developing fetus."